Formerly known as the International Pesticide Application Research Centre, IPARC has focused on application methods for smallholder farmers. 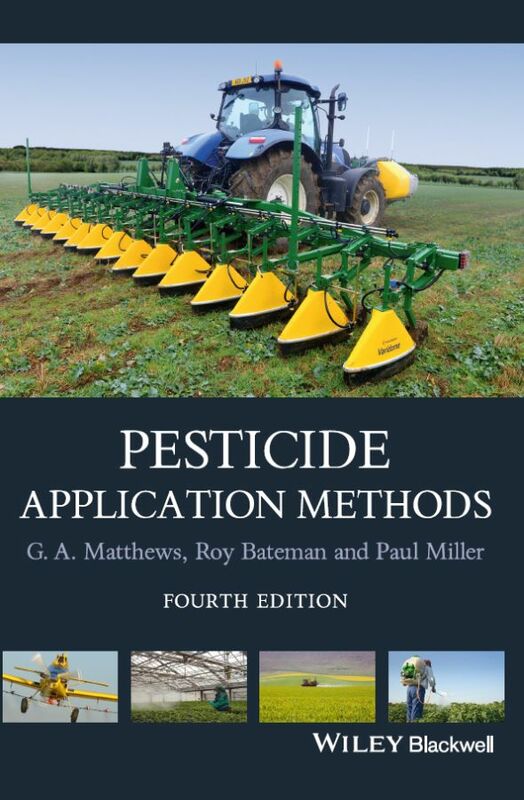 We emphasise practical and cost-effective techniques to manage pests, while reducing the use of chemical pesticides and promoting the efficacy of natural processes and alternative biological agents. Based in Berkshire, England, IPARC has been an integral part of pesticide research at Silwood Park for more than 60 years. It has specialised in the needs of small-holder farmers, application techniques for migrant pest and vector control. Droplet size analysis of a rotary sprayer for Controlled Droplet Application (CDA) developed in collaboration with IPARC scientists. Spraying cotton with a tail-boom, which both improves dose transfer to leaf undersides and reduces operator contamination. IPARC scientists are involved in improvement of application methods for tree crops such as cocoa. Our extensive data base of application equipment, spray nozzles and ancillary equipment (such as the pressure regulating valve shown here) has proved very useful for this work. 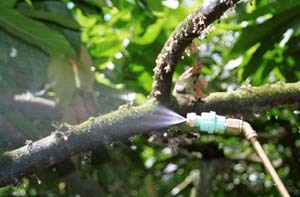 Research is followed-on by training: we produce, or have participated in the development of, a number of guides, books and other training materials, such as the 10-point guide to spraying cocoa. the Yaounde Initiative: a Foundation for improving health and well-being of communities in Africa, through the control of insect vectors of human diseases and improved agricultural production. IPARC scientists have consistently promoted pest control that has minimal impact on the environment. A substantial amount of biopesticide development has been carried out here, including formulation and application development of ‘Green Muscle’ for the LUBILOSA Programme. This product is based on the fungus Metarhizium anisopliae var. acridum, which effectively controls locusts without affecting their natural enemies. In collaboration with ACIS R&D, we are currently carrying out further development of the 'Mycoharvester': a device for extracting pure spores of beneficial fungi such as Beauveria, Metarhizium and Trichoderma spp. 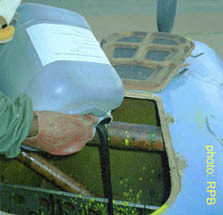 IPARC was involved in a number of research projects related to the 'Electrodyn' sprayer. Unfortunately due to commercial factors, the use of this highly innovative system is now limited to insecticide applications on tree saplings. A project has been carried out in IPARC to design and develop alternative application systems for protecting saplings of Sitka spruce and Scots pine, using conventional pesticide formulations. This system may reduce the risk of operator contamination, both during actual application and when refilling or cleaning the system. The system must also be safe to use, complying with all health and safety regulations. Another requirement is that the volume of waste pesticide solution is kept to a minimum, to reduce disposal costs and risk of environmental contamination. Participatory training on the safe and effective use of pesticide application equipment. 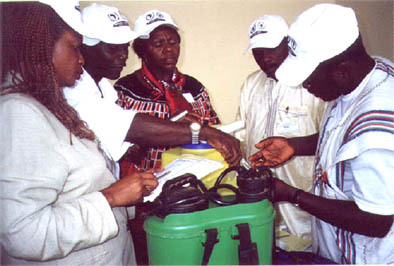 Here, trainees from Cameroon examine a side-lever knapsack sprayer to see whether it conforms to FAO standards (themselves developed in collaboration with IPARC).